Taking concrete steps to help people move across some of Pittsburgh’s favorite infrastructure. Welcome to the Pittsburgh City Steps website. Pittsburgh has more public staircases than any city in the United States. The City’s steps connect communities and provide residents access to transit and other amenities. Nearly two-thirds of the steps are in low or moderate-income areas. They are critical assets in the City’s pedestrian transportation network and beyond. Maintaining the more than 800 sets of steps – containing more than 45,000 individual steps – is an enormous challenge. Approximately 450 sets of steps are built on structures and 350 are built into sidewalks, known as “jumpwalks.” Repairing or replacing an on-structure staircase is a logistical, design, and construction undertaking comparable to a small bridge project. As a result, the City has taken on only a few staircase projects in the last few years. There is a need to prioritize these investments to make the most impact for people walking in Pittsburgh’s hilliest neighborhoods. This website will be updated as more is done to develop a project list. The City of Pittsburgh has developed a systematic method for prioritizing which sets of steps should be repaired and rebuilt. The City used spatial analysis, public input, and field visits to create a prioritized list of steps, and ultimately will develop a list of step-related projects for rehabilitation and renovation in the next few years. The City also reviewed public step maintenance and repair best practices from other U.S. cities and developed guidance about step materials and design. This prioritization process was completed as part of Pittsburgh’s participation in the City Accelerator program, an initiative of Living Cities and the Citi Foundation. After pursuing our interactive map, see sections below for more information on the outreach, methodology, and getting involved. The score is based on estimated usefulness of the set of steps in the pedestrian network. Click on a step to see information on that step and how well it scored. We evaluated the importance of each staircase to the pedestrian network by measuring nearby features and creating four different scores: an overall score, a transit score, a school access score, and a detour score. Use the interactive map to see the scores for each step. People use the steps to walk to the things that are important to them. We counted the destinations near the steps, such as grocery stores, parks, libraries, hospitals, schools, universities, houses of worship, main street corridors, senior or rec centers, public pools, and other city attractions like government buildings, stadiums, etc. The more destinations, the higher the score. A step is more useful if there are people around to use it. Using Census data, we estimated the number of people living within the walkshed of each set of steps. The more people, the higher the score. People choose to walk for many different reasons. For some people, walking offers the most -- sometimes only – affordable means of transportation. To understand areas where people rely on the steps for economic reasons and where the steps are heavily used, we measured the percentage of households without access to a car, the poverty rate, and the rate of people who regularly walk to work. People generally prefer short, direct routes to their destinations. The city steps often provide a more direct route than relying entirely on streets and sidewalks. The step detour measures the distance a person would have to walk from the top to the bottom of a set of steps if that set of steps did not exist. This helps tell us how important a step is to the pedestrian network. The longer the detour would be without the step, the more important the step is and the higher it scores. Steps in areas of the city with more sets of steps, had lower detour scores in general than steps in other parts of the city with fewer steps. That is because if one set was removed a nearby set could be used, minimizing the detour. With all of these steps helping one another, it was difficult to isolate the importance of one individual set of steps. 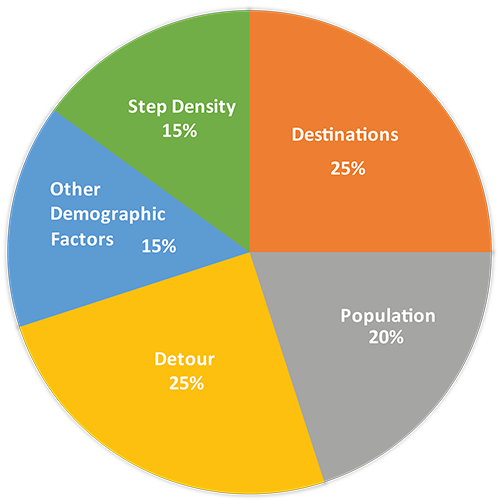 We used a step density score to make sure communities where steps are common receive adequate attention in the prioritization. If there are many nearby sets of steps, it received a higher step density score. As non-drivers, children often rely on walking to get to school. We measure the number of schools within a quarter-mile of each step. The more schools, the higher the score. Every transit trip begins and end with a walk. We used data on how many people get on and off at each bus stop and transit stop to score each step on its importance to transit access. The more transit passengers near the step, the higher the score. Interested in more detailed step prioritization methodology? See here for the full methodology. We gave each step four scores. Each tells us something a little different. Use the Interactive Map to explore the differences. The score is based on the “percentile” in which it falls. For instance, a set of steps that scores “10” scores stronger than 90 percent of all steps analyzed. A set that scores “3” scores stronger than 20 percent of all steps analyzed. Residents can volunteer by setting up a work day with your community group - trash pick-up, weed clearing and railing painting. Community groups and non-profits who are interested in more in-depth partnerships are always welcome- bring us your ideas! Find out more here. Bicycle and Pedestrian committees are neighborhood-based groups that give the city feedback and priorities on pedestrian infrastructure, including staircases. They would love to hear from you. Find out more on Bike Pittsburgh's website. Many Pittsburgh's staircases have received enhanced lighting, public art, or improved signage that has been designed and funded through the work of community groups. To make sure we're making smart investments, we think the 'top steps (link to map or list)' are the best candidates for this work! Write to us about your ideas here. If you would like to report an issue with a city step, please use our 311 Response Center.